Organized at Philadelphia July and August, 1861. Attached to Porter's Division, Army of the Potomac, to March, 1862. Cavalry, 3rd Army Corps, Army of the Potomac, to July, 1862. 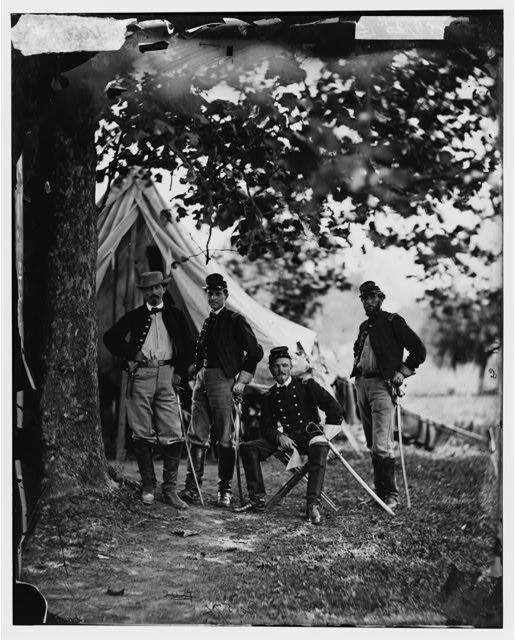 1st Brigade, Cavalry Division, Army of the Potomac, to August, 1862. 5th Brigade, Pleasanton's Cavalry Division, to November, 1862. Averill's Cavalry Brigade, Centre Grand Division, Army of the Potomac, to February, 1863. 2nd Brigade, 2nd Division, Cavalry Corps, Army of the Potomac, to June, 1863. 3rd Brigade, 2nd Division, Cavalry Corps, Army of the Potomac, to March, 1864. Headquarters, Army of the Potomac, Provost Marshal General's Command, to May, 1865. Skirmish at Magruder's Ferry September 16, 1861. Hunter's Mills or Vienna November 26 (Co. "F"). Vienna December 3 (Cos. "F" and "M"). Reconnaissance to Cedar Run March 14-16. Moved to the Virginia Peninsula March 22-30. Near Cockletown April 4 (Co. "A"). Cheese Cake Church May 4. Expedition to James River May 25-26 (Detachment Co. "I"). Battle of Seven Pines, Fair Oaks, May 31-June 1. New Market Road June 8 (Cos. "D," "K"). James River Road near Fair Oaks June 29-30 (Detachment). Jones' Bridge and Jordan's Ford June 30. White Oak Church July 1. Reconnaissance toward White Oak Church July 10. Reconnaissance to Jones' Ford July 31, and to Malvern Hill August 2-8. White Oak Swamp Bridge August 4. Four Locks, Md., October 9. Reconnaissance to Smithfield October 16-17. Bloomfield November 2-3. Markham Station November 4. Newby's Cross Roads November 9. Newby's Cross Roads near Amissville November 10. Near Hartwood Church November 28. Reconnaissance to Grove Church December 1. Expedition to Richard's and Ellis' Fords, Rappahannock River, December 29-31. Operations at Rappahannock Bridge and Grove Church February 5-7, 1863. Chancellorsville Campaign, Stoneman's Raid, April 27-May 8. Near Dumfries May 17 (Detachment). Brandy Station or Fleetwood, Stevensburg and Beverly Ford June 9. Lisbon or Poplar Springs June 29. Old Antietam Forge near Leitersburg July 10. Near Harper's Ferry July 14. Scouting and picketing Upper Rappahannock July to September. Near Catlett's Station October 6 (Detachment). Warrenton or White Sulpher Springs October 12-13. Scout to Piedmont February 17-18, 1864. Sprigg's Ford February 28 (Co. "L"). Campaign from the Rapidan to the James May-June, 1864. Before Petersburg June 16, 1864, to April 2, 1865. Assaults on Petersburg June 16-18, 1864. Charles City Cross Roads June 29. Consolidated to a Battalion of three companies July 27, 1864. Non-Veterans on duty in Cumberland Valley till mustered out August 24, 1864. Reconnaissance to Hatcher's Run December 9-10. Pursuit of Lee to Appomattox Court House April 3-9. Provost duty at Richmond May 4-8. Transferred to 5th Pennsylvania Cavalry May 8, 1865. Regiment lost during service 1 Officer and 41 Enlisted men killed and mortally wounded and 2 Officers and 125 Enlisted men by disease. Total 169. HUNTERSON, JOHN C.: Philadelphia, Private, Company B, 3rd Pennsylvania Cavalry. On the Peninsula of Va., 5 June 1862. Citation given: 2 August 1897. While under fire, between the lines of the 2 armies, voluntarily gave up his own horse to an engineer officer whom he was accompanying on a reconnaissance and whose horse had been killed, thus enabling the officer to escape with valuable papers in his possession. MILLER, WILLIAM E.: West Hill, Captain, Company H, 3rd Pennsylvania Cavalry. Gettysburg, Pa., 3 July 1863. Citation: 21 July 1897. Without orders, led a charge of his squadron upon the flank of the enemy, checked his attack, and cut off and dispersed the rear of his column. Died December 10, 1919, buried Gettysburg National Cemetery, Gettysburg, Adams County, PA.